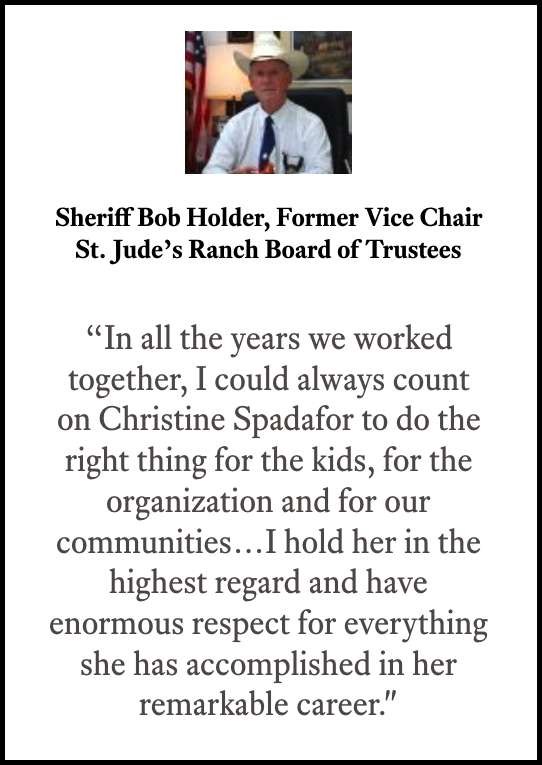 Christine Spadafor is the former CEO of St. Jude’s Ranch for Children (SJRC) – a nonprofit organization founded in 1966 to serve abused, abandoned and homeless children. This page presents SJRC’s key accomplishments (Fiscal Year 2007 – Fiscal Year 2014) by CEO Christine Spadafor and her team. From turnaround to stability to growth – this team transformed SJRC from a struggling charity into a nationally recognized success story. In 2006, SJRC with locations in Nevada and Texas (acquired in the 1990’s) was on the verge of bankruptcy. Given this precarious state, SJRC’s National Board of Trustees understood the urgent need for fundamental change. This much was clear: SJRC’s decades-old business model could no longer meet the needs of its vulnerable kids. The Board hired CEO Christine Spadafor who designed and led an ambitious turnaround strategy. Spadafor’s ultimate goal: better therapeutic programs for more kids – a mission that would require transforming SJRC's fractured organization and antiquated business model. 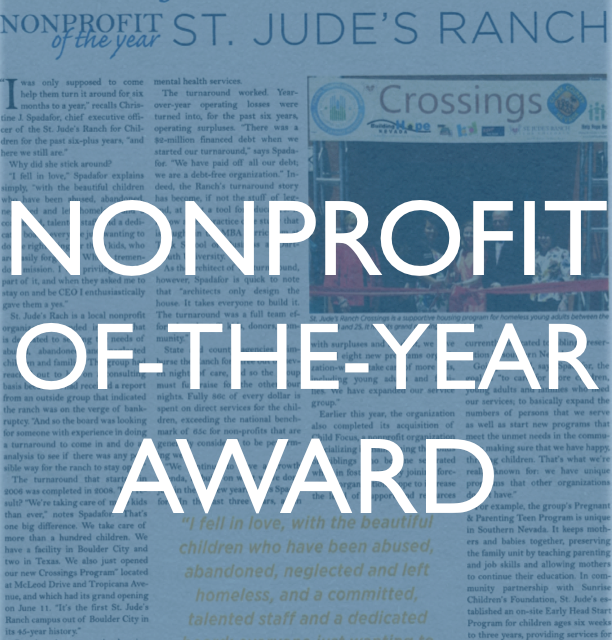 She and the Board together engaged key stakeholders – SJRC’s executive team, its staff, the kids, the community and the volunteers — and enlisted their help in achieving a turnaround. With the clock ticking, this committed team went to work. Within months, meaningful progress was evident: more kids were being served, quality of care increased, and revenue was growing. Over time, this unwavering focus on the children and consistent execution of the strategy brought impressive results (see slideshow above)­. Others also took note that something extraordinary was happening at SJRC. As SJRC expanded the numbers and ages served and the expansion of programs and locations, performance results drew the attention of one of the nation’s top consulting firms, which ultimately donated more than $1M in pro bono services. This firm wanted to be part of this ongoing transformation — more services to more at-risk populations to improve their lives and to leverage the great work already done, making the Ranch a national beacon for nonprofit innovation. In 2014 this firm designed a detailed, 3-year strategic roadmap for SJRC’s continued growth — both organic and by acquisition. In fiscal year 2015, however, SJRC's newly reconstituted Board chose to go in a direction away from the recommended national model. Rather, the Board elected to return to the business model and organizational structure SJRC followed in 1966. 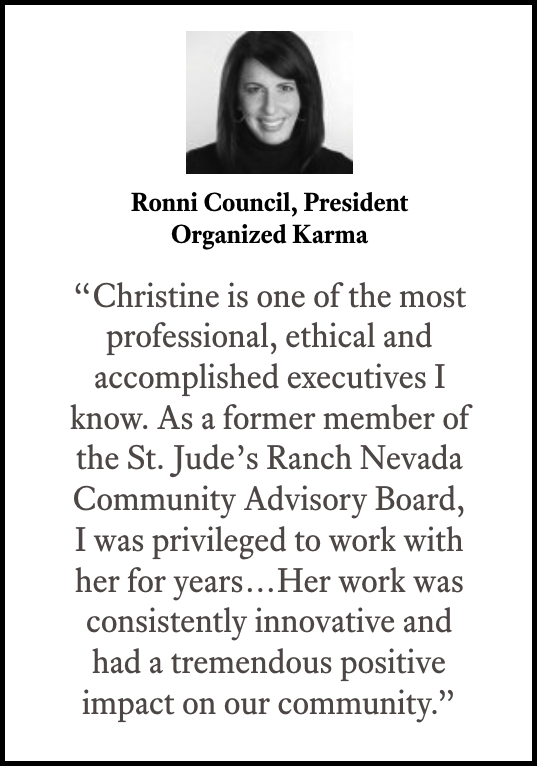 CEO Christine Spadafor resigned in fiscal year 2015. 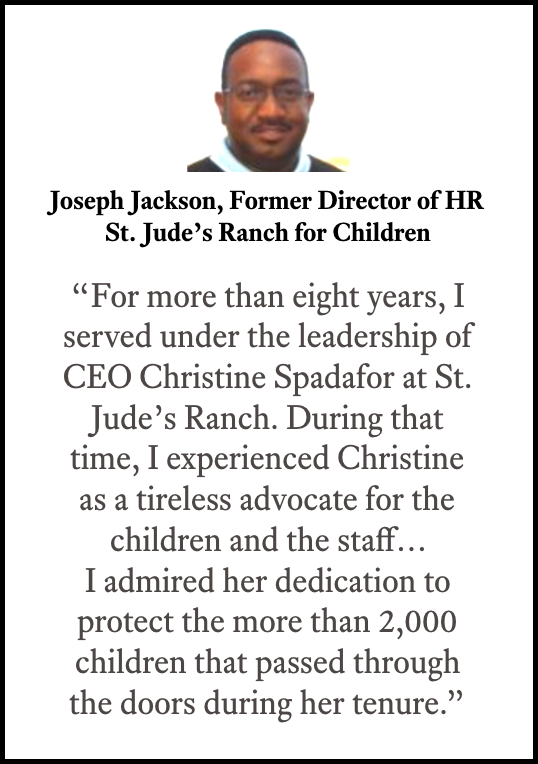 CEO Christine Spadafor was featured in this article about the turnaround at St. Jude's Ranch for Children. More Than 100 Community Partnerships! 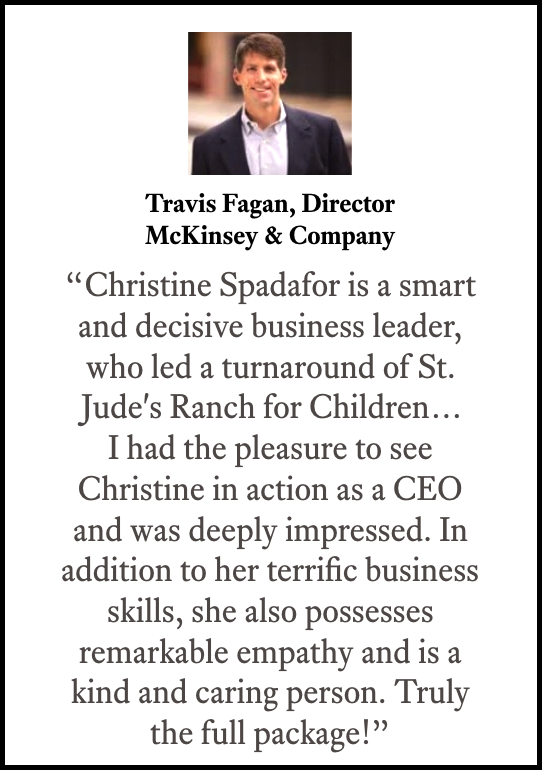 In the years since Christine Spadafor and her team executed these innovative strategies, the lessons of St. Jude's Ranch for Children have been taught to MBA students and nonprofit organizations. 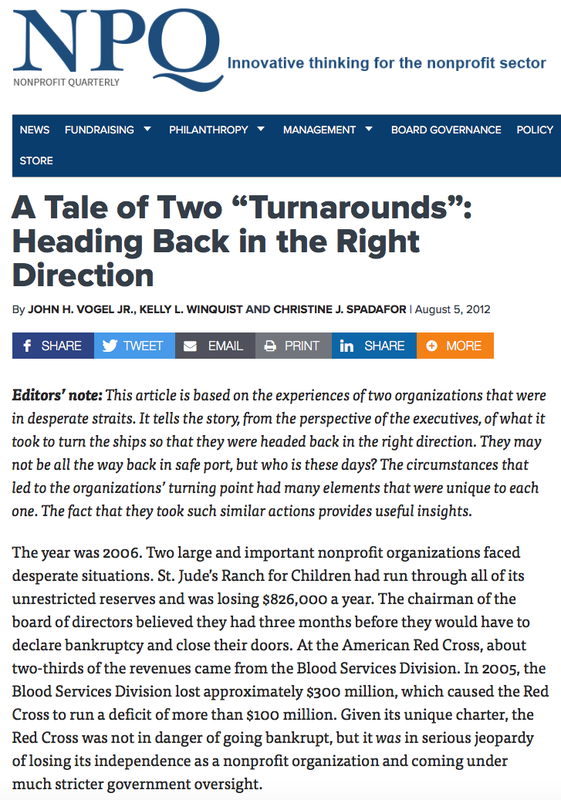 Shown below are excerpts from two leading case studies — from Dartmouth's Tuck School of Business and the Nonprofit Quarterly.